The Institute’s guide to interim service providers 2017 contains advice and guidance about how to get the very best out of working with interim service providers. The guide includes data from the IIM’s interim management survey 2017. 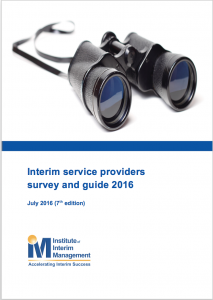 The Institute’s guide to interim service providers 2016 contains advice and guidance about how to get the very best out of working with interim service providers. The guide includes data from the IIM’s interim management survey 2016. 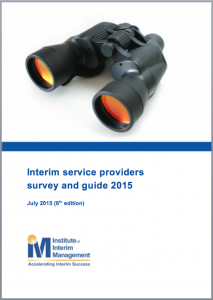 The Institute’s guide to interim service providers 2015 contains advice and guidance about how to get the very best our of working with interim service providers. The guide includes data from the IIM’s interim management survey 2015. 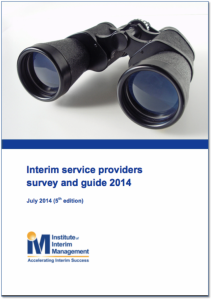 The Institute’s guide to interim service providers 2014 contains advice and guidance about how to get the very best our of working with interim service providers. The guide includes data from the IIM’s interim management survey 2014.